It's official. My addiction to gyros is spreading, and has begun to infect my loved ones. A while back, Mazzah Mediterranean Grill was the daily deal on LivingSocial.com, and I was able to snag a $40 certificate for $18. It took several weeks of badgering on my part, but eventually I was able to persuade my housemate to pack up the kids and accompany me to their strip mall location on State Street between 17th and 18th Streets. This was necessary because the only thing I can eat $40 worth of in a sitting is sushi, and unfortunately the certificate had to be used all at once. Mazzah is one of those restaurants that's not only nice enough to have a website, but also to post their menu there. I have only ever gotten one thing from Mazzah: the gyro platter. The children went with rather predictable choices, chicken strips for the tween and a grilled cheese for the toddler. 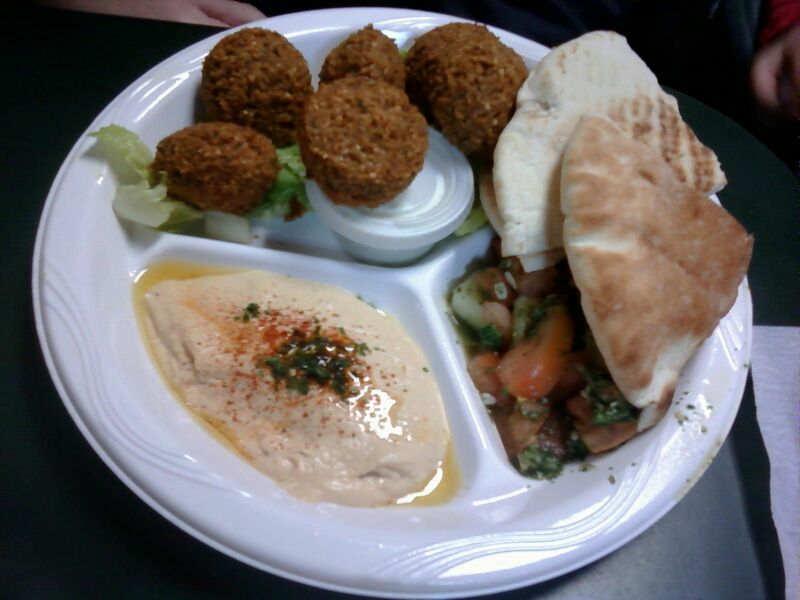 My fellow adult wasn't having as easy a time with it, but finally decided on the falafel platter. Business was brisk, and while the ladies found a table that could accommodate the four of us, I placed our order with a cashier who looked remarkably like a young Milla Jovovich, so much so that I had to comment on it. Turns out either she had never heard of Milla Jovovich...or maybe she just has an even drier sense of humor than I do. Either way, I ordered a couple of pieces of mini baklava and a piece of kataif to accompany our meal, and she removed it from the bakery counter and handed it to me on a plate right then and there. When I arrived at our table with it, we had a grown-ups meeting and somehow arrived at the conclusion that it would be a good idea to eat dessert first. Just lately, I've really been rediscovering my love of baklava, and though my experience may be a little limited I felt this was a very good example of it. Not too sweet, not too chewy or crunchy, and you feel your teeth break through every single fragile little layer of dough. This was my first time having kataif though, and to be honest, I still don't know what I think about it. It's definitely a cousin to baklava, but I'm not sure I dig the shredded wheat-style topping. Regardless, the taste was still right on the mark. 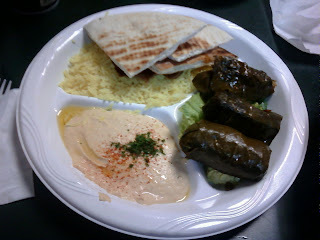 Each platter at Mazzah comes with basmati rice and two sides, and I had chosen hummus and dolma. I'd never had dolma before, and I wasn't terribly impressed. This version is comprised of grape leaves stuffed with rice and vegetables before being cooked in a mixture of lemon juice and olive oil. I'm not entirely sure what about the combination put me off, but my first thought was that perhaps I just don't like grape leaves. The rice and pita were good though, and in fact the rice had gyro meat scattered over it. The hummus I was very impressed with, smooth and creamy without being heavy even though it was dressed with olive oil. That pile of food is only part of the total platter though. In addition to everything mentioned above, I still had a pretty substantial gyro to get through. The flavor of it was also very good, despite the meat being just a tad dry and the feta a little skimpy, since it's still head and shoulders above some of the others I've had in Boise. Despite all the debate as to what to order, my lady friend had overlooked two important things: First, that the falafel platter is one of two that do not come with the basmati rice that she was craving. Second, that the Lebanese salad consists primarily of cucumber, which is just fine, and tomato, which she cannot stand. I did the gentlemanly thing and swapped my rice for her salad, since I'd been debating ordering it myself anyway. It didn't grab me at the time, with its mixture of veggies, dressing and mint, though I could see it being very refreshing in the summer months. On the other hand, the falafel was delicious, crisp on the outside but soft and fluffy within and nicely seasoned. Most of the time this is where I would wrap things up, but about a week after the visit I've just described, my housemate decided that we needed to return. As in immediately. Even though it meant paying full price! So once again, the children were packed into the car and before I knew it I was once again standing at that counter and placing a table's worth of orders. Another gyro platter for me (déjà freaking vu), but this time my housemate acted decisively and chose the chicken gyro platter. Both of us opted for hummus and falafel as our sides, and this time both of the children went the grilled cheese route. Just for the hell of it, I ordered a piece of spanakopita to try as well. In an interesting twist of fate, a mistake caused a delay in one of the grilled cheese orders and resulted in them bringing us an extra half of a sandwich, which ended up immediately being split between the adults. The grilled cheese was every bit as good as the previous visit, but neither of the adults dug the spanakopita, which is basically a kind of spinach pie made with phyllo dough and feta cheese. I tasted the same seasoning that was in the dolma from the week before, I'm not sure what it is but it doesn't agree with my palate. Amazingly enough, my meal was even better than on my previous visit. More feta on the gyro, and the meat had its crispy bits while still retaining some moisture. And whereas before my rice was topped with some gyro scraps, this time there were a number of large strips. Even the pita was toasted better and more evenly. My housemate was happier this time as well, having gotten both the rice and falafel she was craving, and having what I believe was probably her first gyro (albeit a chicken one). I managed to snag a bit of meat out of it, and while the texture was more like rotisserie chicken than gyro meat, the seasoning was delicious and that's all that matters to Ms. Golden Rule. Neither one of us were really able to finish our meals though, and agreed that next time we would get a platter, split the sides and an extra gyro to go with it. Finally, it was desert time. 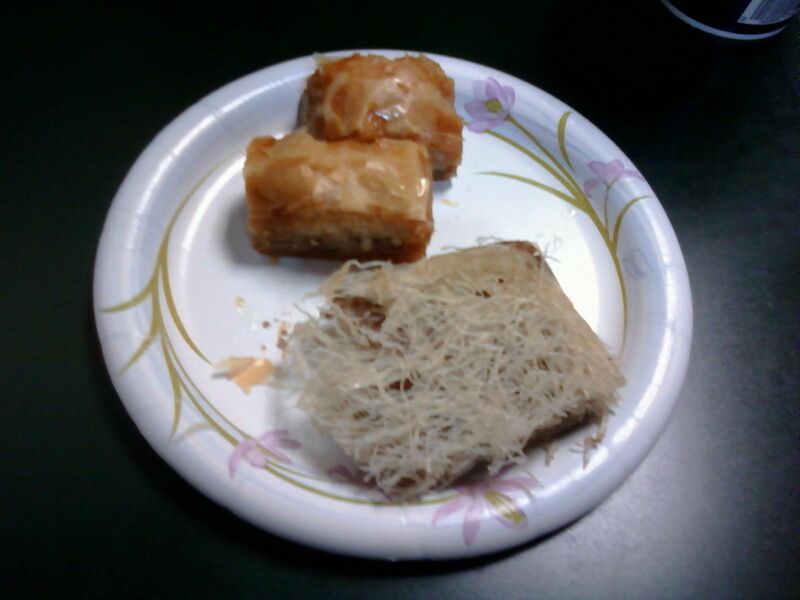 This time we opted for full pieces of baklava, and we weren't disappointed. Everything I said about the mini pieces before was amplified and multiplied here. I think I'm going to try my hand at making homemade baklava here soon as well, but in the meantime it's nice to know I can get a giant piece for a reasonable amount of money. I also got one of the other things on the menu that was really intriguing me. I was intrigued by the shape and the idea of the chocolate almond baklava, but in the end it turned out not to be significantly different than the regular, just with a little slivered almond on top and some drizzled chocolate. Not bad at all, but give me the old-fashioned stuff any day. The plating on a couple of those dishes seems a little off. Still, that doesn't change the fact that those dishes are mouthwatering. I'm especially curious about the gyros.